Happy Memorial Day! We hope you are enjoying the holiday with your family and friends, celebrating the unofficial start of the summer! As the warm summer weather rolls in, there's an increase in the amount of body and food oils that can contaminate your leather goods. These contamination spots are usually found in high use areas where hair, hand or body oils may be in direct contact with your leather and are typically darker in color. But have no fear! Here at Furniture Clinic, we have the perfect product to extract oil and grease contamination from all your leather items! 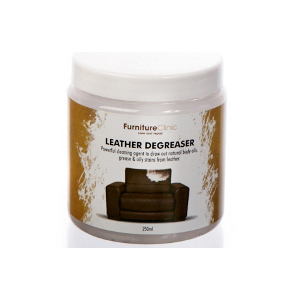 Follow these steps on how to use our Leather Degreaser to restore your furniture to brand new condition! The first step to ridding your leather of grease and oil contamination, is to clean your leather thoroughly with our Leather Ultra Clean. We advise to spray our Leather Ultra Clean onto a Terry Towel and give the grease stained area a thorough clean. If the grease stain has built up over years of use (where you rest your head or hands) you should soak the leather in our Leather Ultra Clean and squeeze the leather through the Terry Towel. This will absorb a larger amount of grease into the towel saving the amount of Leather Degreaser used. We advise to apply our Leather Degreaser with a paint brush over the stained area and allow it to dry. As the Leather Degreaser dries, it will extract the grease and oil from your leather and dry into a powder. The powder will change to a yellow/brown color where the oils have been extracted and will be white everywhere else. Once our Leather Degreaser has thoroughly dried on the surface of your leather, you will then vacuum off the powder. After vacuuming off the powder from the surface of your leather, you will then want to clean the stained area using our Leather Ultra Clean. Â If the leather still has any grease left in it, keep repeating the above processes again until it has gone. Once you have extracted all the grease & oil contamination from your leather, you may need to restore color back to your leather goods. You can use our Leather Re-Coloring Balm which is used to renovate the existing color of absorbent type leathers. One 8.5 fl. Oz. jar of our Leather Re-Coloring Balm will allow you to restore color to a three-piece suite. If you have a non-absorbent type leather, you will be using our Leather Colorants where you will restore color and a new finish to your leather. To re-color and re-finish an area smaller than the size of a tennis ball, you would use our Leather Repair Touch Up Kit which includes a base color and three additional colorants so you can mix and match the color to your leather. You simply need to choose the base color that is closest to your leather and add the additional colorants to achieve an accurate color match to your leather. To re-color and re-finish an area larger than the size of a tennis ball you will use our Leather Colorant Kit which is not just a standard dye but an actual process in which you first remove the manufactures finish with the leather prep so this allows the colorants to adhere to the leather giving a sound base covering. 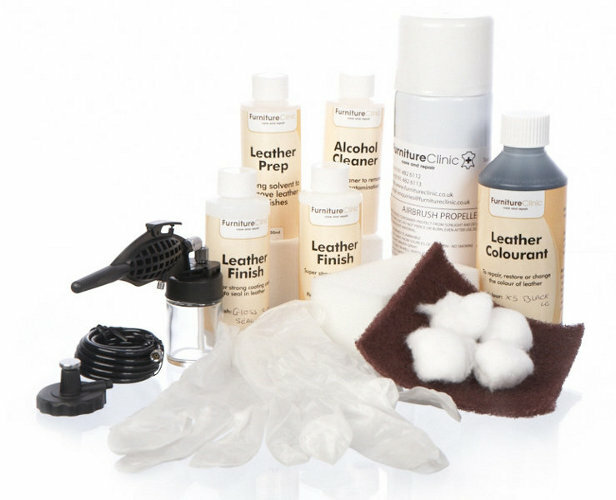 Our Leather Colorant Kit will give you everything you need to prepare, recolor, and refinish your leather including all accessories. Once you have extracted the oils and restored color to your leather, you will now want to protect your leather from future staining with our Leather Protection Cream. This product will not only feed and nourish your leather, but also use its advanced barrier technology to help repel staining. We advise to clean and protect your leather every 3 to 4 months using both our Leather Ultra Clean and Leather Protection Cream. We offer our Leather Care Kit where you will receive 17 fl. oz. of both our Leather Ultra Clean and Leather Protection Cream for an exceptional value. Now's the time to get your leather restored before the summer brings out oils and grease that can damage your leather goods. If your leather does fall victim to any grease or oil contamination, follow this guide to extract and prevent future contamination from occur! Happy Memorial Day!